Toyota has always been renowned for manufacturing cars with advanced and innovative features. No wonder, Toyota Etios Cross has some of the best features in the particular segment of cars. Coming to the factory fitted audio system in the Toyota Etios Cross, it has to be noted that the music system is the best in its class. However, not all the models of the Toyota Etios Cross have a factory fitted audio system. Variants such as 1.5V, 1.2G and 1.4GD do not have an in-built music system. 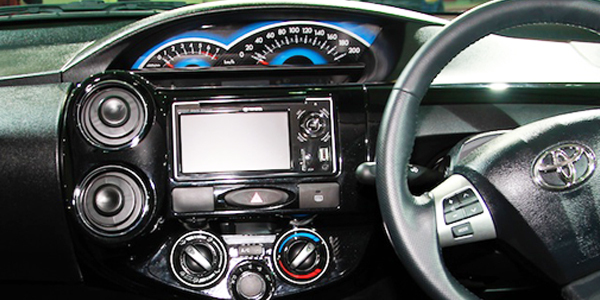 Other variants of Toyota Etios Cross come equipped with a factory fitted music system. The 2 Din audio system featuring a remote control has an AM/FM radio. Additionally, the music system is USB, Aux and Bluetooth compatible. Ford Figo, Maruti Suzuki Swift and Hyundai Grand i10 – cars in similar price brackets also boast of music systems in select variants. Lastly, it should be noted that the speakers in the Toyota Etios Cross deliver unmatched sound quality and performance. The variants of Toyota Etios Cross that offer music system as standard include 1.2 X Edition, 1.4 X Edition, G, GD, V, VD.